While located in the Northwest, clinics can be arranged for groups and organizations almost anywhere! Local river courses are mostly accomplished on the Snoqualamie River, while coastal kayaking varies from Lake Union to Deception Pass and the San Juan Islands. water on Lake Union, Lake Washington or Lake Sammamish. Bellingham: Between Boat Works in Fairhaven and Lake Padden, there is access to salt water trips or warm, protected fresh water. Port Angeles: Again, we can put-in in multiple places: the public beach downtown, the kayak and sail park on the hook, Freshwater Bay, or the lake along the Elwa. We can even whitewater kayak on the Elwa and surf at Crescent Beach! Neah Bay, La Push: More great places to see the vast Pacific ocean and do some surfing! Port Townsend: Always a pleasure, visit a Victorian seaport on the corner between the Straits of Juan de Fuca and the Puget Sound. 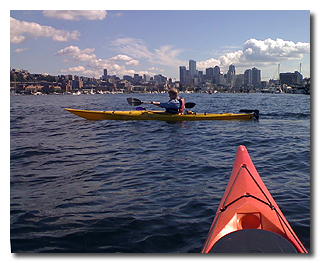 Do a little kayaking, stay at a B & B, even indulge in some shopping!